به منظورارزیابی تنوع آللی زیرواحدهای گلوتنین در تخمین کیفیت نانوایی در ارقام و لاین های امید بخش گندم نان دیم، 29 ژنوتیپ گندم دیم، با روش SDS-PAGE مورد مطالعه قرار گرفتند. بر اساس الگوی باندی پروتئین‌های گلوتنین در جایگاه ژنیGlu-A1، ژنوتیپ های Rasad ،Karim ،Sabalan ،Ohadi ، 3 ،4، 5، 8، 9، 10، 11، 14، 17، 19، 21، 22، 23و 24 آلل 1، در ژنوتیپ‌های 6، 7، 12، 13، 16، 20، Homa و Rijaw آلل *2 همچنین در ژنوتیپ‌های 16، 18 و Azar2 آلل نول مشاهده شد. 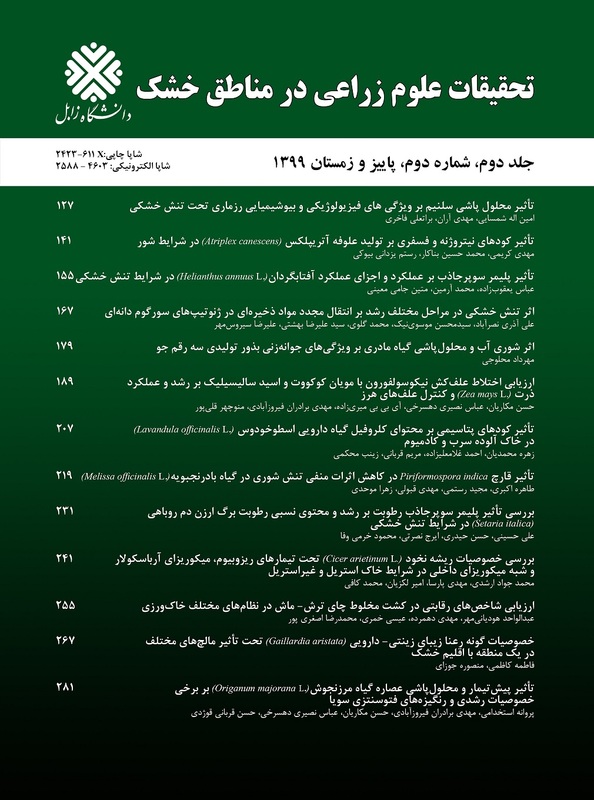 در جایگاه GLU-B1 ژنوتیپ‌های Ohadi ،Rijaw ، 5، 9، 13، 16، و 21 آلل 9+7، در ژنوتیپ‌های Azar2 ،Homa ،Karim ،Rasad ، 7، 8، 10، 12، 19، 20، 21 آلل 8+7، در ژنوتیپ‌های Sabalan، 3، 4، 6، 11، 18و24 آلل 18+17 و در ژنوتیپهای، 14، 15، 17 و 23 آلل 16+13 شناسایی شد. در جایگاه GLU-D1 ژنوتیپ‌های Ohadi ،Rijaw ، Karim ، 5، 9، 11، 13، 14، 15، 22 و 23 آلل 10+5 و در ژنوتیپ‌های Azar2 ،Sabalan ،Rasad ، 3، 4، 6، 7، 8، 10، 12، 16، 17، 18، 19، 20، 21 و24 آلل 12+2 مشاهده شد. همبستگی بین صفت درصد پروتئین دانه با عدد زلنی مثبت و معنی دار و همبستگی درصد پروتئین دانه با میزان نشاسته منفی و معنی داری بود. براساس تجزیه به عامل ها دو عامل اول 8/72 درصد تغییرات را توجیه کردند. بر اساس نتایج تجزیه رگرسیون گام به گام، ارتباط بین آلل نول و سختی دانه و همچنین ارتباط بین آلل 9+7 و صفت عدد زلنی معنی دار بود. In order to evaluate the allelic diversity of Glutenin Subunits in estimating the quality of bread wheat, 29 promising dryland wheat genotypes were studied by SDS-PAGE. It was found that for Glu-A1 locus, 1 allele was observed for Karim, Rasad, Sabalan, Ohadi, 3, 4, 5, 8, 9, 10, 11, 14, 17, 19, 21, 22, 23 and 24 genotypes, for 6, 7, 12, 13, 16, 20, Homa and Rijaw genotypes, allele 2* and for 16, 18 and Azar2 genotypes, null allele was observed. In GLU-B1 locus, 7+9 allele was seen for Ohadi, Rijaw, 5, 9, 13, 16 and 21 genotypes, 7+8 allele was observed for Azar2, Homa, Karim, Rasad, 7, 8, 10,12, 19, 20, 21 genotypes, 17+18 allele was seen for Sabalan, 3, 4, 6, 11, 18, and 24 genotypes, and 13+16 allele was observed for 14, 15, 17 and 23 genotypes. In GLU-D1 locus, 5+10 allele was observed for Ohadi, Rijaw, Karim, 5, 9, 11, 13, 14, 15, 22 and 23 genotypes, 2+12 allele was observed for Azar2, Sabalan, Rasad, 3, 4, 6, 7, 8, 10, 12, 16, 17, 18, 19, 20, 21 and 24 genotypes. Significant Positive correlation was found between grains protein with zeleny number and significant negative correlation was observed between protein and starch percentage. Based on principal component analysis, two factors were identified that can explain 72/8 percent of diversity. Based on stepwise regression analysis, significant correlations were also found between null allel and hardness, and between 7+9 allel and zeleny.